Reviewed by Dr. Francois Mifsud, lecturer, Department of Inclusion and Access to Learning, Faculty of Education, University of Malta. April 2018. The recent collection of poetry by Professor John P. Portelli Xewqat tal-Passa/ Migrant Desires accompanies the reader into the crossroads of East and West, peace and conflict, joy and despair, personal and public, patriotism and universality. Portelli does not spare the reader the meandering and wondering experience that crossroads bring in his personal life and in the life of the reader. His poems enter deep into the aporetic point of contact between the ‘call for action’ and ‘the paralysis generated by fear and confusion’. Portelli engages with the reader not as a spectator but as interlocutor, with whom the poet discloses his innermost feelings and sentiments. The variety of topics and themes that Portelli develops unfold within a ‘threefold time game’ between past, present and future. It seems that when one of the time referents is omitted by the author, the expectation is on the reader to bring it forth. This dramatic threefold time game is clearly visible in the poem I Remember / Niftakar where his reflection focuses on the past Colonialised Malta and on the present EU and migration destiny Malta, and instigates in the reader a reflection of what future Malta might be. The restless soul of the poet aims to initiate restlessness in institutions that claim clarity and harmony. Portelli’s pen confronts institutions with the disturbing encounter with their ethical responsibility. For example, in the poem, The Bread of Neoliberal Pragmatism / Ħobżet il-Pragmatiżmu Neoliberal Portelli dares to tease the sleeping monstrous institution that guards the doors of status quo and of self-interest. It is very difficult to describe the style of Portelli’s poetry since for him poetry becomes an accompaniment of his encounters with diversity, the new and other from the self. Thus, since his poetry emerges from these encounters, his writing to welcome the newness of his diverse experiences assumes an eclectic style. Notwithstanding such ecclecticism, there is a connectivity that creates a flow from one poem to the next. A silver thread that connects Portelli’s poems is the Socratic dual action of self-awaking, which subsequently instigates the other’s awakening. Portelli’s own experience awakening of himself as an ethically responsible person provokes the awakening of ethical responsibility in the reader. The presence of the Socratic awakening in Portelli’s collection merges poetry with pedagogical praxes, where the use of provocative questioning becomes a call for reflection and responsible action. In other words, Portelli’s poems offer a provocation for the reader to act as responsible agent. In the poem To a Gazan Farmer/Lill-Bidwi ta’ Gaża, Portelli politically confronts the reader with a question with the intention of imagining both the consequences of the present and other future possibilities. While for Portelli the contemplation of the past and the present is pivotal, he utilises the question to unleash the imagination of the reader from the present limitation and to offer diverse future possibilities. 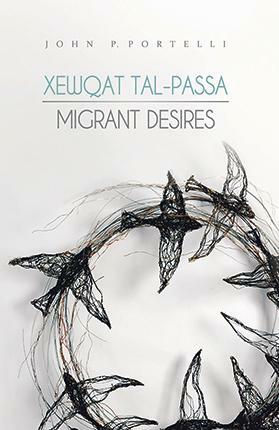 Xewqat tal-Passa/Migrant Desires offers lots of possiblities for the engagement with diverse contemporary themes and issues, and hence is intended to engage with an audience that is willing to participate in critical reflection and dares to become a protagonist for future possibilities. Portelli’s utilisation of his pen as an art that is also pedagogical makes this book an ideal tool for teens and youths who need to see poetry as a companion of their wonders, tribulations and dreams. Accordingly, it would be ideal if this book would be read and discussed in our schools or in other places where younger generations are engaged with not as spectators but as protagonists of future possibilities.